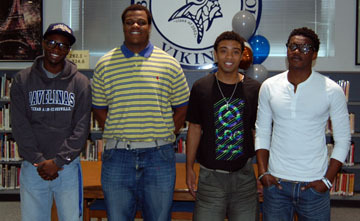 Seniors Shavon Pennie, Tim Hines, Johnny Childs and Barry Densey signed their letters of intent to play college ball next year. Students gathered in the library to sign their documents making their commitment official and guaranteeing them a place on the team next fall. Senior Shavon Pennie will attend Texas A&M at Kingsville. Senior Tim Hines will attend Navarro Jr. College. Seniors Barry Densey and Johnny Childs will attend Tyler Jr. College.